On Sunday 24th at the Electric Circus in Edinburgh, many people from the am dram world gathered to surprise June Geissler with a birthday bash to celebrate her reaching the dizzy heights of 80 years young. 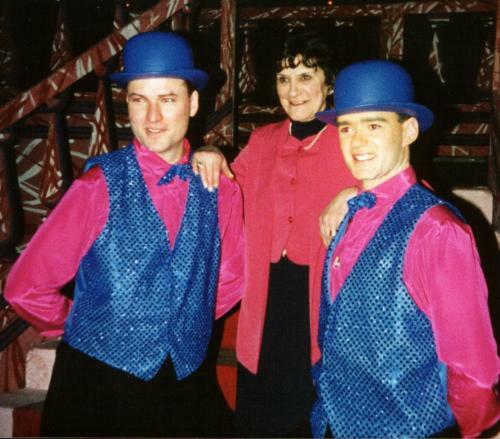 June has choreographed many of the shows staged in and around Edinburgh over the past 20 to 30 years and in the fifties and sixties there was The June Geissler School of Dancing and The June Geissler Ballet School regularly staged concerts at The Church Hill Theatre in Edinburgh. Winifred Walker and Freda Seymour members of the school who went on to join The Ballet Rambert in London, formed by Dame Marie Rambert in 1919, from where many famous dancers started out. It just goes to prove what a great dance tutor June was and still is even though she is now 80, she can still teach the young ones a thing or two though she hasn’t got the same puff as she used to. Anyways when June walked in and saw everybody her first words were ” I didn’t know I was so popular”, she then proceeded to recall how earlier in the week on a visit to the Sherraton Hotel to celebrate her birthday with friends she almost burnt the place down, upon lighting a third sparkler the fire alarms went off and the whole place was evacuated. It reminds me of the old joke about a man having lit the 80 candles on his cake, had to get the fire brigade to attend to put them out as he didn’t have any puff, and yes the fire brigade did turn up at the Sherraton but only as a precaution. At least it saved June lighting the other 77 sparklers. She wont forget this birthday in a hurry. Many congratulations June, did you say what show you were doing next? June has choreographed six shows for The Smycms. ← Singers Wanted For Concert. I also was at the June Geissler ballet school in the early 70s and am now 52. I caught sight of my mother and everyone ran round in tutus in a circle in the Churchill theatre and I just stood looking at my mother!!! I too went to June Geissler’s ballet school in the mid 60’s. wonder if I was in your ballet class Louise. I remember doing a couple of shows at the Churchill theatre, one being the black and white minstrels. In another one my tutu burst up the back. I too was wondering if there were any old photographs.